Protect your wealth by investing in this Silver 90% coin. Contains 71.5 ounces of. Item is in Average Circulated condition. You will receive randomly selected dates in your order. Authenticity guaranteed by The United States Mint. This 90% coin is the perfect investment to add to your precious metals portfolio. Each package is fully insured. If you do not receive the package directly from the common carrier, you agree to take all reasonable actions to assist in recovery of the package, including but not limited to filling out reports (and/or police reports) and providing all information needed or that may be requested to assist in recovery of the package. A: While we cannot guarantee that you will receive the exact item(s) pictured in the listing itself, the item(s) you receive will be of comparable quality. Photos are meant for reference and may not be of the exact item you will receive. Q: What does BU mean? A: BU stands for Brilliant Uncirculated. Prices Q: How often are prices updated? A: Prices of bullion products vary due to the ever-changing nature of spot prices. For this reason, we update our pricing feed every 10 or so minutes. Orders Q: Will I have to order minimum or maximum quantities? Q: Can I change or cancel my order once it's placed? Q: Is my package insured? We fully insure each package at no extra cost to you, during transit. We also do not cover if the package has been left with someone else, such as a building manager, neighbor, or drop-off location. We also do not cover packages that are signed for by the apartment or building management. Q: What should I do when my package is lost in transit? We will begin an investigation on the lost or damaged package, and may require a police report if the loss is due to theft or tampering. Your assistance is greatly appreciated, as this will help speed up the investigation, and resolve the missing order. A: Yes, if you have a gift card or promo code, you may use it at checkout. A: The "Order details" section will display which, if any, portion of the order was paid by gift card or promo code. You have no right to cancel your order. We reserve the right to refuse or cancel any order at any time, including if it is deemed questionable or of significant risk to Pioneer Metals regardless of price confirmation. Order changes are not permitted. We suggest you take the time up front to make sure what you want is exactly what you request from us as reflected in your order. We work hard to provide accurate Product and pricing information to you. However, pricing or typographical errors may occur. 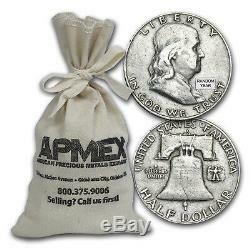 The item "90% Silver Franklin Half-Dollars $100 Face-Value Bag Avg Circulated, 71.50 oz" is in sale since Friday, July 7, 2017. This item is in the category "Coins & Paper Money\Bullion\Gold\Other Gold Bullion". The seller is "pioneermetals" and is located in Oklahoma City, Oklahoma. This item can be shipped to United States.